Compared with the new ViewSonic VX2435wm, the Acer looks like a bit of a poor relation, despite costing a few extra pounds. For starters, the grey plastic finish looks a little dull and uninspiring next the ViewSonic's clean and ultra-modern, piano black lines. The Acer is also less well connected, with just a relatively humble choice of D-Sub and DVI sockets for video inputs. At least the DVI socket is HDCP-compliant, for compatibility with other high definition devices and content. 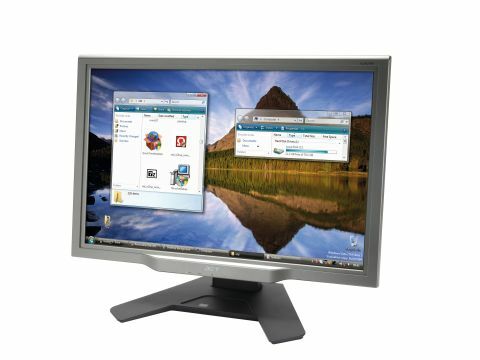 Typical for a 26in widescreen monitor, the Acer boasts a highly useful and usable 1920 x 1200 pixel native resolution, backed up by a 500cd/m2 maximum brightness and 800:1 contrast ratio. The latter is a little lower than on the ViewSonic but the Acer still packs plenty of contrast, to the extent that there's no need to go above the 50 per cent default value on the adjustment scale. There's also a DCR (Dynamic Contrast Ratio) menu option, which boosts the standard range to 1600:1, if you really want to set the world on fire. Adjustments themselves are quick and easy to apply, thanks to an intuitive on-screen menus system. We think it's a little over-simple in places, with just the bare minimum of 'warm', 'cool' and 'user adjust' colour settings, and not a sRGB selection to be seen. The good news is that, while colour options are fairly basic, the 'warm' colour setting is nigh on perfect for editing and viewing photos, or for watching movies. The Acer is also a little quicker than the ViewSonic in response time, with a 5ms grey-to-grey value, although in real terms, it proved impossible to distinguish between the two when watching fast-paced, on-screen movie action. For text, the Acer proved extremely crisp, although no more than the ViewSonic. The speakers are also a little lower powered, at just 2W each, not that the audio capabilities of either monitor is exactly a strong point. The ViewSonic is more stylish and is a better choice for those who like ultra-vivid picture quality, or who simply have to have an HDMI socket, while the Acer is a better bet if accurate colour rendition and a more natural looking picture is the requirement you need the most.